So there I was the other night, enjoying my dinner, when I came across a strange thing. 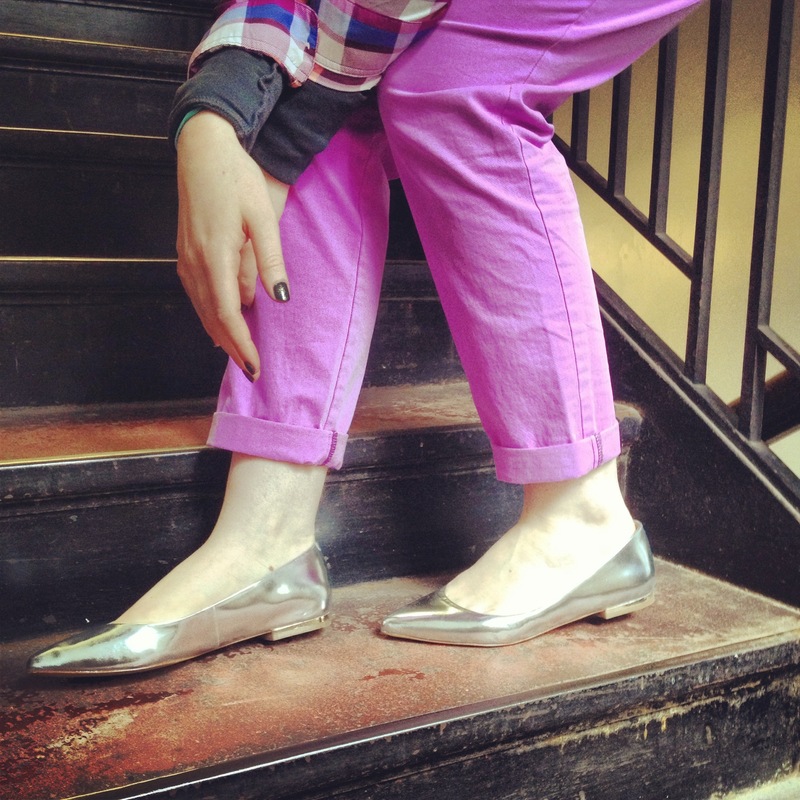 I was paging through a J Crew catalog and saw…my outfit. …that I didn’t get at J Crew…puzzling. 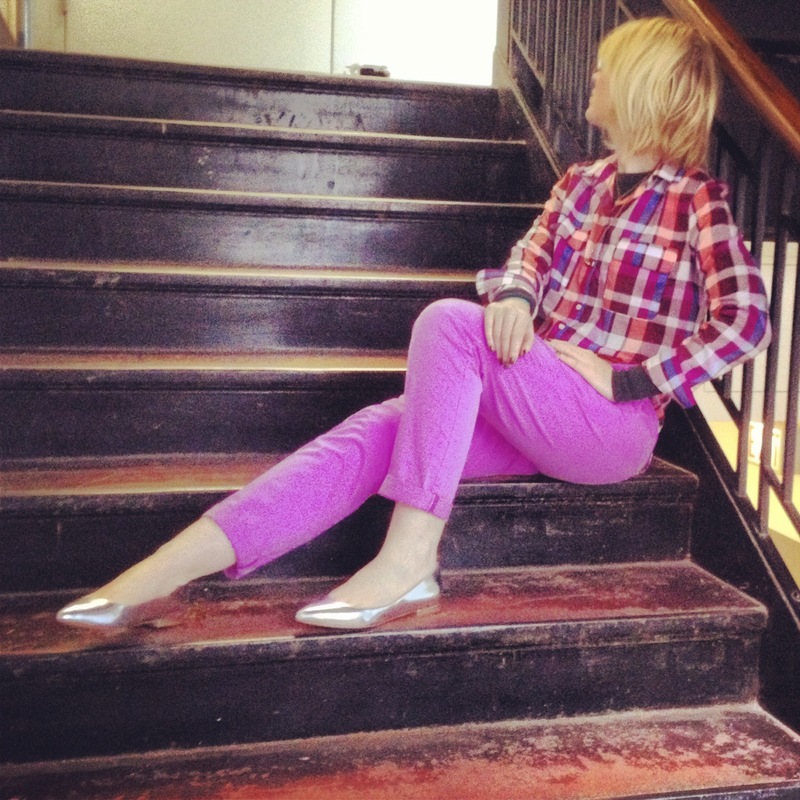 Purple pants, purple plaid top and metallic shoes…hmm… The only reasonable conclusion is that someone from J Crew was following me when I shopped and decided to showcase my purple ensemble in their catalog. Yes. That must be it. It’s the only logical explanation. Can I have a moment with this uncanny matching outfit situation? Okay, thanks. Their lovely outfit can be bought for $515. My outfit would have been $205…had I paid full price. But, this is a budget fashion blog, so you can reasonably assume I didn’t pay full price for anything. I ended up huntressing my whole outfit for, yep, $39. As my mom would say, “Hot dog.” As a result of this odd coincidence, I call this outfit my double take purple plaid party ensemble. (Side note: I was inexplicably watching a Full House rerun and eating Jimmy Johns during this moment, so it was a party on a lot of levels) (should I not have admitted that?) (thanks for not judging). 1) I cannot stress enough (maybe I can) that I feel very strongly that good prices do not have to mean sacrificing any quality! These days, there are sales just about everywhere. There are even sales at high end shops such as Burberry (though the prices aren’t quite as low as featured on my blog). Most items do eventually go on sale, so keep a lookout for pieces that you’ve admired at full price. I also recently created an email address just to give out to all the places (in stores and online) that ask for an email address. As a result, all of the store coupons go to one place so that I can easily retrieve them. I get nearly weekly emailed coupons from some stores including Banana Republic, Gap and Old Navy. Some of the coupons can even be used on sale items. The separate email address is an easy way to organize coupons and not clutter your personal inbox. 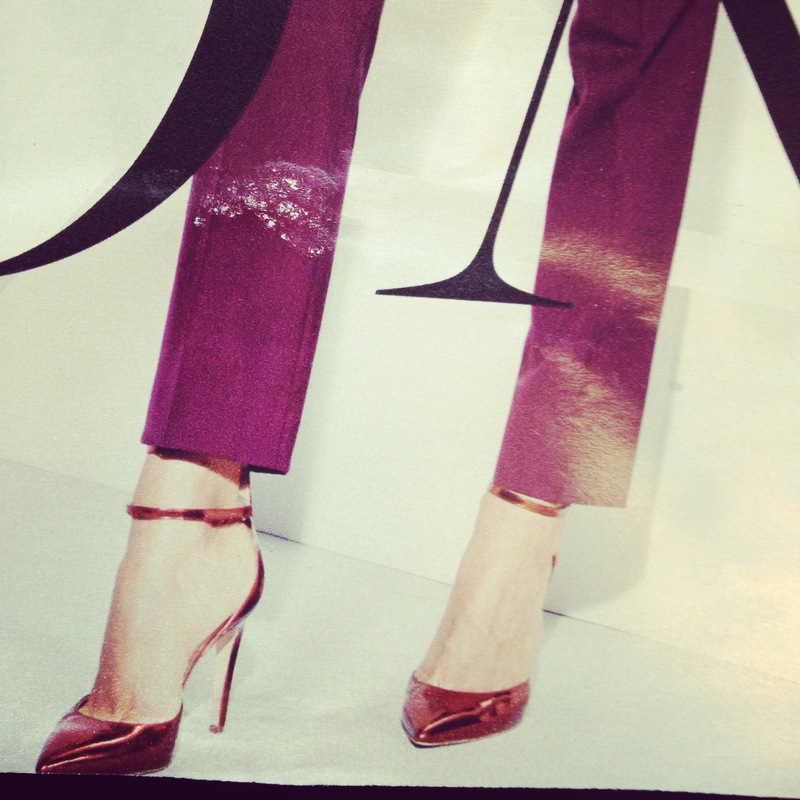 2) The other day in one of my posts I mentioned wearing cropped pants in fall and winter. At this point, I’m fully embracing cropped pants for fall! 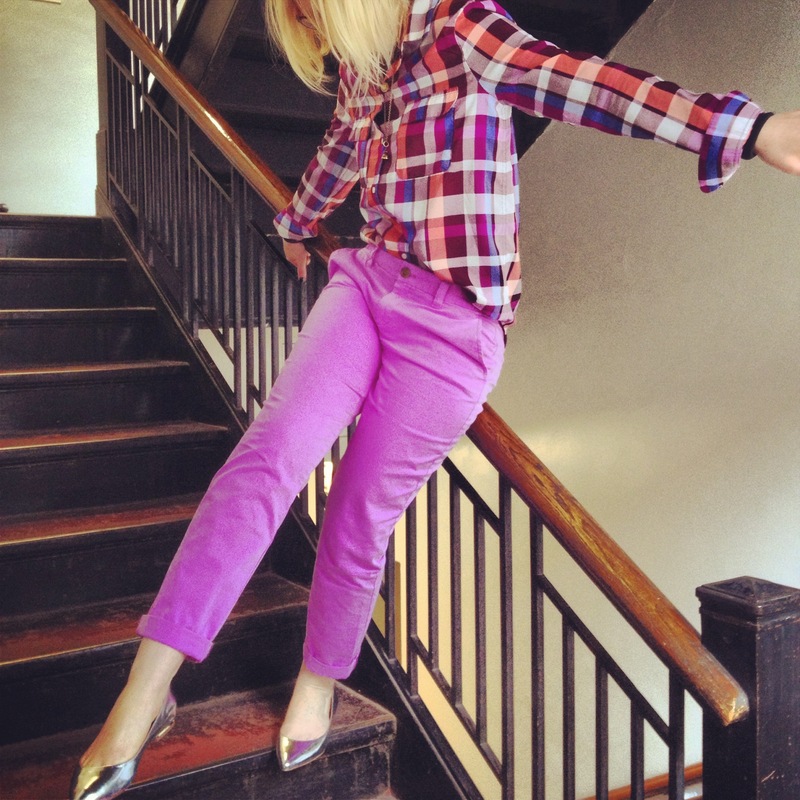 By wearing plaid/flannel on top, these pants look completely fall (and work) appropriate. I added a shirt underneath the plaid top for extra warmth, and you really could not see it at all. However, the extra layer kept me warm given that my ankles and feet were bare. My official stance on cropped pants in fall and winter is: it’s a go. Anyone else embracing cropped pants in cooler weather? Have you too found your own outfit in a catalog while watching Full House? So chic ! 🙂 great everyday look! I love your version and Jimmy Johns by the way! Much more respectable! Thanks for not judging- haha!! Ha ha ha. Never judgment from me. Wow – I absolutely love this outfit and I can’t believe how much you paid for it! Amazing! LOVE this color on you :). And you know I have a weakness for plaid! Jcrew is totally copying you!! Great matching. Yes, one should try always to get a bargain. As always, great outfit and great find. Wow what a coincidence! This outfit is so cute! I really can’t believe what great deals you found on these items, especially the shoes. Have a great weekend! That’s crazy, but you know what they say, great minds think alike 🙂 I love the purple on purple look, especially with the plaid shirt, you are looking gorgeous. I love so much your outfit, happy week-end! well clearly J Crew had their people follow you around and then replicate the look for the catalog, because it’s so damn fabulous!! love this outfit, amazing colors and the metallic heels really add a cool twist to it all! I need to watch!! I keep meaning to add it to my queue!! Girl- you have the best, most accessible style sense around. I’m not surprised that you are on trend even before they show off such an ensemble! I’ve been meaning to ask- do you have a blog entry showing off how you organize all of your stuff? Purses, shoes, scarves, necklaces, etc? I would love to see what you work from when getting outfits together! This is a great question! I definitely have some organization- though my closet really needs some organizational loving. I would be happy to show how I organize the things that are actually organized though!! Completely perfect! Love your outfit inspiration. You pieced this together with GENIUS styling! a) Isn’t this top the best?! I can’t stop wearing mine, the quality is amazing! b) my daughter is hooked on Full House so I use her as my excuse for watching it when really I just can’t seem to get enough of it shhhhh;) c) I really need to try Jimmy Johns I keep hearing everyone rave about it d) you look incredible as always and really have me contemplating cutting even more of my hair off! haha, that’s insane, you’re right, they were totally following you! Good on you finding that for a fraction of the price! Loving these happy colors for fall. Cropped pants, Full House, AND Jimmy Johns are a GO (they are freaky fast, after all). The only reasonable explanation is that J Crew has seen your blog and has hired some sort of corporate fashion spy in order to poach the trendiest of trendy ensembles from your closet. Take it a (creepy) compliment. 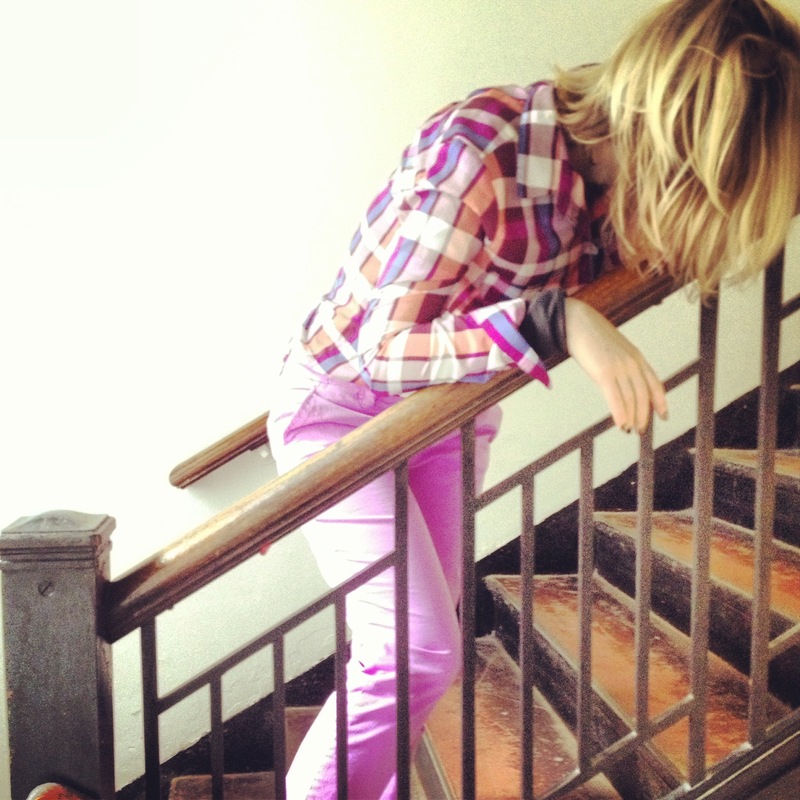 You have me thinking… where are my purple skinnies?!? So cute! Haha! Not thus far but I have gotten some amazing awkward stares and been pretty freezing during the photographing of the outdoor pictures!